Pediatricians Say Teens Should Be Barred from Tanning Parlors : Shots - Health News Artificial tanning beds greatly increase the risk of skin cancers and should be banned for teens, a leading group of pediatricians says. Most people get 25 percent of their lifetime sun exposure before age 18. Steer clear of the tanning salon, doctors tell teens. Tanning beds should be outlawed for children and teenagers, according to new guidelines from the American Academy of Pediatrics. That's because exposure to the artificial ultraviolet light used in tanning beds vastly increases the risk of melanoma and other skin cancers. "Fake bake" tans remain popular, despite the fact that more than 60 percent of states have restrictions on the use of commercial tanning facilities by minors. About one-third of 17-year-old girls have visited a tanning parlor at least once. Spring is a particularly popular time for fake tans, as teens try to build up a base before beach trips and proms. Since most people get 25 percent of their lifetime sun exposure before age 18, much of recent efforts to prevent skin cancer has focused on reducing UV exposure by children and teens. People who use tanning beds have a 74 percent higher risk of melanoma than people who don't, according to a study published last May. 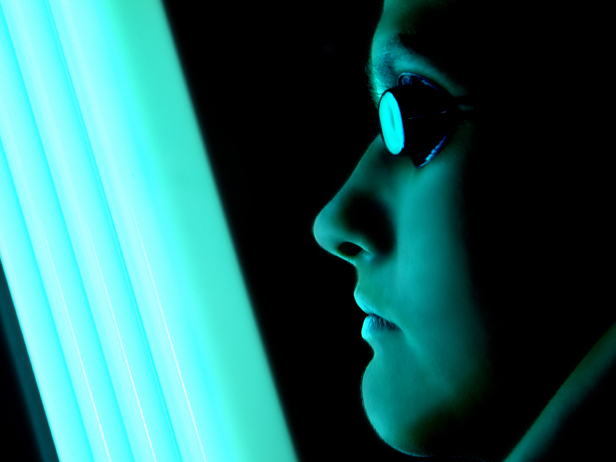 The UV light generated by sunlamps and tanning beds can be 10 to 15 times more intense the UV in sunlight. Ultraviolet light damages DNA in the skin, causing cancer. The Food and Drug Administration held hearings last year on a possible federal ban, but an FDA spokesman told Shots that any action by the feds is months away. A 2009 survey found that most tanning salons were good at telling callers who sounded like 15-year-old girls that they needed parental permission, but not so good at conveying other state-required warnings, like saying that new clients shouldn't bake more than three times in the first week. The pediatricians called for politicians to not only ban tanning beds for the under-18 set, but make sure those bans are enforced. They join the American Medical Association and the World Health Organization in calling for tougher regulation. Recognizing that there's no such thing as a healthy tan doesn't mean that children should huddle inside by the Xbox, according to the pediatricians. Instead, children should be "strongly encouraged" to play outside. But that means that children also need to be wearing sunscreen; wearing sun-protective clothing and hats with brims; and trying to avoid sun exposure between 10 am and 4 pm. Sunlight helps the body produce its own vitamin D, so the pediatricians caution that protecting youngsters against exposure to the sun may need to be combined with greater attention to better diets and possible vitamin supplements.